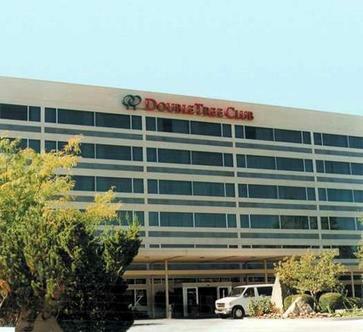 The Doubletree Club Boise hotel is nestled near the Boise River in the shadow of the Boise foothills, and is located minutes from Boise Airport, Boise State University and the Idaho State Capitol building with easy access to I-84.While staying with us, be sure to enjoy the many aspects the Doubletree Club Boise hotel has to offer: Airport and local shuttle service, Complimentary wireless Internet service in all rooms and public areas, A full service Business Center, Audio/visual equipment services, Conference rooms, Fully equipped fitness center, Heated outdoor pool, 1,430 square feet of meeting space, eEvents - Ideal for booking fewer than 25 guest rooms or for booking space for an all-day business meeting, wedding, reunion or special event. Relax at the end of the day in our Creekside Lounge, Stop by The Cafe for a bite to eat, We proudly serve Starbucks coffee Wolfgang Puck coffeemakers and coffee in every room, Special Packages - Giving you more for your dollar.The Doubletree Club Boise hotel is centrally located with easy access to the many attractions that Boise, Idaho has to offer: Boise State University - Only seven blocks away, Bogus Basin Ski Area - Offering 2,600 acres of winter fun with seven chairlifts, Nordic trails, snowshoe trails and a place for tubing, only 20 minutes away, Morrison Center for the Performing Arts, Zoo Boise, Idaho Historical Museum and Boise Art Museum - Located within walking distance of each other, Idaho Ice World - Your destination for indoor ice skating, Many nearby golf courses, Roaring Springs Water Park - Where you won't find your typical poolside waterslide.Whether your stay involves work or play, make the Doubletree Club Boise hotel your destination. Our friendly and courteous staff is looking forward to welcoming you with our very special, signature warm chocolate chip cookie at check-in.